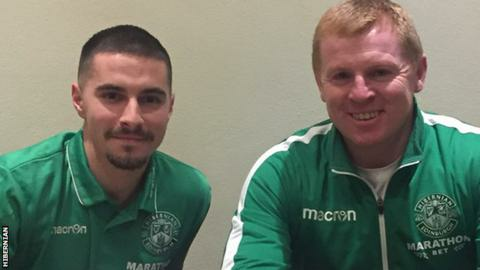 Hibernian have signed Australia international striker Jamie Maclaren on loan until the end of the season. Maclaren, 24, has made only eight appearances for German second-tier outfit SV Darmstadt 98 this season. The Melbourne-born forward, who has five caps, is desperate for first-team action to boost his prospects of making Australia's World Cup squad. Maclaren has joined the rest of the Hibs squad at their winter break training base in the Algarve, Portugal. The Leith side are fourth in the Scottish Premiership, and face Edinburgh rivals Hearts in the Scottish Cup fourth round on their return to action on 21 January. "I am delighted to be joining Hibernian for the rest of the season," he said. "I've spoken to the manager and he has high hopes for the second half of the season, and hopefully I can contribute to that. "It's a big few months for me personally with the World Cup on the horizon, so I'm very motivated to get some goals and hopefully force my way into the final squad for Russia." Maclaren, who previously represented Scotland at Under-19 level, will compete with fellow strikers Anthony Stokes, Simon Murray and Oli Shaw for a place in the Hibs side. Hibs head coach Neil Lennon has already brought in goalkeeper Scott Bain on loan from Dundee during the January transfer window, while Shaw has signed a new contract extension.